Bag of 100 Specialist Brick Plugs with fitted seals designed to secure PermaSEAL membranes to building substrates and to fix battens or tracking systems. PermaSEAL Quick Plugs are used to secure PermaSEAL System membranes to brick, concrete, stone and other masonry surfaces. They are supplied with a rubber grommet so that when the plug is fixed into the substrate the grommet creates a compression seal against the membrane to stop any water ingress. The PermaSEAL Quick Plug also has a preformed hole in the head of plug allowing battens or tracking systems to be secured to it via a size 10 screw. 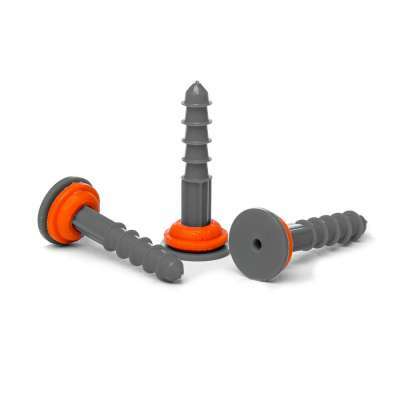 These membrane Plugs are designed to give a rapid fix into varying substrates. It can be installed into either 10mm or 11 mm holes depending on the substrate. Installation is quick and easy, simply drill a 10mm or 11mm hole (depending on the substrate) to a depth of 70mm. Then put the PermaSEAL Quick Plug into the hole and use a large head hammer to gently drive the plug in. Make certain that a good even seal is achieved. I have always used (self sealing plugs)*moderated* with most of the membrane work I carry out. I saw the advert on facebook and decided to add a bag to my order just to test them. Received my order this morning with the new plugs. These plugs are Brilliant! So good I have been testing them in various substrates in this basement this morning, they grip into everything so far brick, block, stone, render, soft bricks, insulation blocks. I will now be buying the Perma-Seal Quick Plugs with every order. Highly recommended for anyone using membranes!